Product prices and availability are accurate as of 2019-04-25 08:49:28 CDT and are subject to change. Any price and availability information displayed on http://www.amazon.ca/ at the time of purchase will apply to the purchase of this product. Enjoy data transfer rates of up to 5Gbps and spend less time syncing. 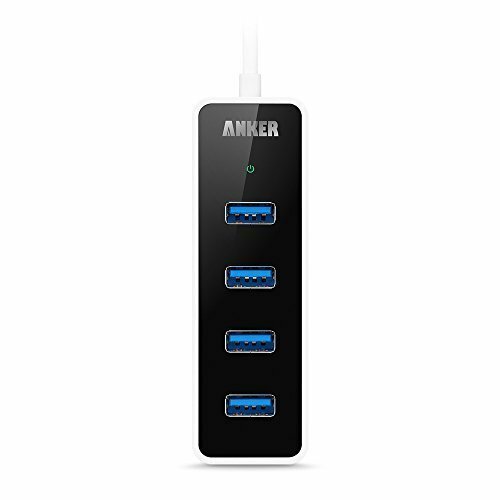 Easily add 4 USB 3.0 SuperSpeed ports to your PC, eliminating the trouble of switching among devices. Palm-grip size and "power-bar" design effectively saves space. Beautiful blue LED indicates operation. Designed with a built-in surge protector to keep your devices safe. Supports hot swapping. Package contents: Anker 4-Port Hub (with built-in 1 ft cable), instruction manual. Free lifetime technical support and 18-month manufacturer's warranty.